1878 - 1904 دولار فضي مورغين VG+ Order your 1878-1904 Morgan VG+ silver dollar from our online store today to enjoy the lowest price on the internet. 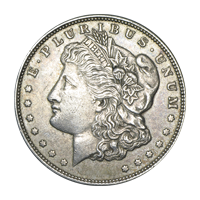 Morgan Silver Dollars are amongst America’s most collectible treasures, as they represent a significant turning point in U.S. coinage history. The reverse of the coin features a bald eagle, holding arrows and an olive branch in his talons, while spreading his majestic wings. The eagle is encapsulated in a laurel wreath, which symbolizes victory and the feature is joined on the reverse by the motto, ‘In God we trust,’ the American legend and the coin’s unique denominational value. The obverse of each coin features British born, George Morgan’s striking effigy of Lady Liberty, who wears a Phrygian cap that has been dressed with cotton and wheat and inscribed on the ribbon with the word, ‘Liberty.’ Also on the obverse, the motto, ‘E pluribus unum’ or ‘Out of many, one,’ as well as thirteen stars, the coin’s year of issue and a light, decorative border. These coins have been given a VG+ rating on the coin grading scale, as it displays a surface quality only narrowly missing the requirements for a higher grade. Own your piece of American history and fortify your holdings with a 1878-1904 Morgan VG+ silver dollar today.